The top of the building says K of C, Knights of Columbus. Did K of C have theaters like Masonic lodges? It would be nice if someone could find out the history of this theater when it opened, who owned it what it was called when it opened, etc. The thumbs only 2 screen theatre Dolby Digital Surround Sound Cinema 1 300 seats, Cinema 2 70 seats. New seats installed in 2001. 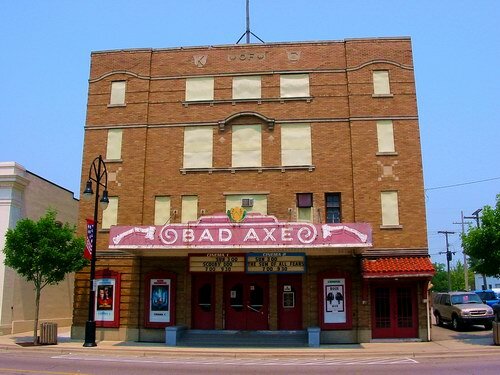 This classic small town movie theatre in Bad Axe, Michigan is depicted in Popcorn Palaces, the book about the history of small town theaters (which includes paintings by Davis Cone). In recent years, the balcony was enclosed to create a second auditorium. Cinema Treasures Link.